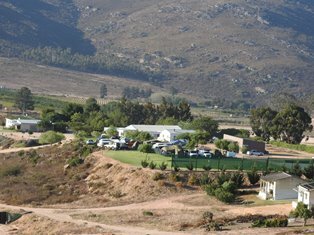 Kardoesie campsite, restaurant and farm stall is at the top of Piekenierskloof Pass, with stunning views. We camped there for Easter and found many Virtual Museum records. Several weaver colonies were found, but being the non-breeding season, the nests were old, but the records show the distribution of colonies, nest sites, and minimum colony sizes. 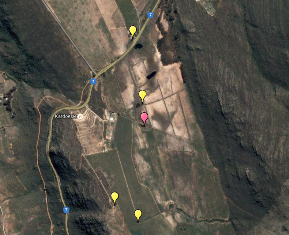 A Southern Red Bishop nest was found in reeds at a small dam (pink marker on map), and 4 Cape Weaver colonies (yellow markers on map). Two Cape Weaver colonies also had stick nests of larger birds, probably a Hadeda nest (PHOWN 19053) and a crow nest (PHOWN 19045). Three Cape Weaver colonies were in exotic trees: gums (PHOWN 19045), oaks (PHOWN 19053) and pine tree (PHOWN 19051). Interestingly, a single Cape Weaver nest was in a protea (PHOWN 19046). Small flocks of Southern Red Bishop were seen near the dam. Many Cape Weavers were seen around the campsite and farm stall. Yellow Bishops were not seen but should occur. The most interesting Virtual Museum record turned out to be 2 records. I lifted several rocks to look for scorpions. 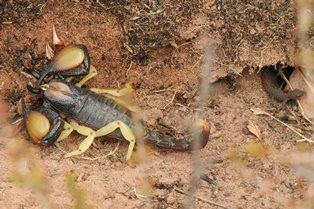 As I lifted a rock, a centipede was disturbed and grabbed by a scorpion - the prey is visible in the photo (see also ScorpionMAP. I was so focussed on the scorpion, that I only noticed the gecko under the same rock (see cropped photo at ReptileMAP), when I looked at the photo on my laptop!